There are few things I love more than reading a good book and then evangelizing about it to everyone I see. Not just friends and family either. When I say everyone I see, I mean baristas, dog park acquaintances, and Trader Joe's employees. (I mean, I love giving recommendations so much I made a whole website devoted to it, so it shouldn't come as a surprise.) In the past few months quite a few books that I've been raving about have announced film adaptations, and some have even begun filming. Maybe you've read a few (or all) of these titles and are also looking forward to their screen adaptations. Maybe you're looking for something to add to your reading list! Either way, get ready for a lot of books to come to a screen near you very soon. 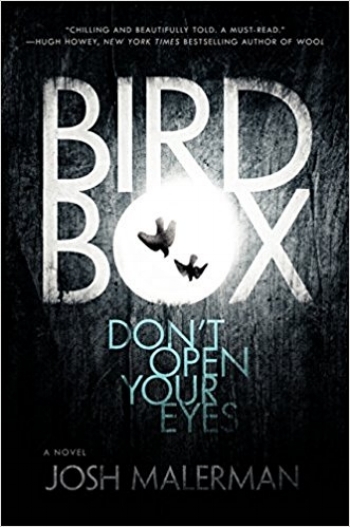 Bird Box is marketed as a horror novel, but if you're put off by the horror genre don't avoid this book. There's nothing really gross or horrific in the novel, but it is one of the most tense thrillers I have read in a long time. I don't know if I can remember the last time I was so worried, squirming in my seat and feeling my heart race as I flipped through the pages, truly anxious about what would happen next. So no, nothing is going to leap out and give you nightmares, but you may end up putting this novel in the freezer for a bit. Bird Box follows a woman named Malorie after an apocalyptic event where an unknown entity roams the streets, and any living creature that sees it goes mad. All people stay in their boarded up homes, and blindfold themselves whenever the have to go outside. The book jumps back and forth through time, showing Malorie and her sister before the event, during Malorie's time in a house with other survivors, and when she decides to brave the outside world with two small children in hopes of finding a sanctuary. The film adaptation is going to be on Netflix with Sandra Bullock playing Malorie. At first I thought this was an odd casting choice, because I pictured Malorie being much younger, and she has to be really mean, and don't we all consider Sandy Bullock our imaginary BFF? Malorie trains the two kids from their infancy to live in a world with this horrible monster in it, to the point where she teaches them as babies to wake up without opening their eyes. She also doesn't use their names, only calling them Boy and Girl, because she thinks in this world names are a luxury they just can't afford to have. It comes across as being borderline abusive, but when you think about what kind of world they're living in, maybe she's right. It'll be interesting to see Sandra Bullock, Earth Angel, in such a role. Another reason to be excited about Bird Box? It's going to be directed by Susanne Bier, who directed The Night Manager (which I loved), with a script from Eric Heisserer, who wrote Arrival (which I also loved). There are a few books in my life that have made me long to have grown up in a house full of sisters. Obviously Little Women and Pride and Prejudice fall under that category, but To All The Boys I've Loved Before makes me ache to be a Song girl. Lara Jean lives with her widowed father and her older sister Margot and younger sister Kitty, and the girls are largely responsible for running the house and managing domestic tasks. The girls are also Korean on their mother's side, and incorporate both their Korean heritage and their mother's memory into their lives. Lara Jean is always baking (as I mentioned), and, just putting this out there, I'd be very interested in a Lara Jean cookbook (even just a Christmas cookie ebook!). Jenny Han went to the set of To All The Boys I've Loved Before and I was so thrilled to see her work coming to life (you know I was all over her social media desperate for any news). It's especially great because the three Song sisters are all being played by Asian American actresses, and I can't think of a single American teen movie that's had an Asian American protagonist. Representation matters! The titular character in Dumplin' (Christian name: Willowdean) is a fat girl. Now, when I say there's a YA book with a fat protagonist your mind might immediately conjure a story about a girl who feels ugly and ignored and learns to find the beauty within. This is not that book. And thank Julie Murphy for that! Will is completely confident and thinks she's just fine the way she is. Her mother is a former beauty queen and her best friend looks like a Pretty Little Liars cast member, but this isn't that story, remember. Will gets a job at a fast food restaurant and discovers that her coworker is a hot jock named Bo. (I was telling a friend about Dumplin' earlier and described Bo as "a real CW lookin' guy.") Will obvs gets a raging crush on Bo, and is surprised when Bo returns her feelings. Will and Bo pursue a relationship, but Will finds her confidence dwindling. She just doesn't see how teen dreamboat Bo would be interested in a girl like her. Will is certainly comfortable with herself, but she's worried about Bo not being into her and dumping her, which then erodes her self-confidence. So how does Will decide to gain back her bold, confident persona? By entering a beauty pageant. And who will teach her how to put on a great show? Her mom, the former beauty queen, or her BFF, who is also in the pageant? TRY A GANG OF DRAG QUEENS. Patrick Ness has been sharing casting news for the film (which will just be titled Chaos Walking) on social media and it is UNSANE. (Also, according to IMDb, Charlie Kaufman worked on the screenplay.) The movie doesn't come out till March of 2019, but you can use the wait to read the books if you haven't already. They're a bit long for YA books, but they're so suspenseful and gripping you'll tear right through them. I am a huge fan of Curtis Sittenfeld, to the point where I'll read something just because it has her name on it. BUT, when I saw that Curtis Sittenfeld had written a modern retelling of Pride and Prejudice, I was doubly intrigued. In Eligible, Chip Bingley is a former contestant on a Bachelor-esque dating show, and the Bennet family lives in Cincinnati. It's a super fun, easy read that anyone who is familiar with Pride and Prejudice will enjoy. Bonus points if you are also familiar with the Midwest, as this book has many great midwestern touches that I (a midwestern gal) loved. It was just announced last week that Eligible is being developed into a series at ABC. They got a put pilot commitment, which essentially means that the show will almost certainly make it to air (the studio will have to pay a huge penalty if, for some reason, they decide they don't want the show on their schedule). I'm interested to see how the show would last over a long period of time (You never know - what if it's a huge hit and ABC wants eight seasons? You've gotta have a plan!) but no matter what I know I'll be watching.